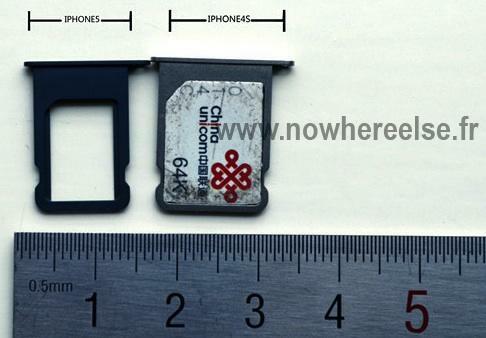 A few new images have popped up that are supposedly a good look at what the nano-SIM tray will look like in the iPhone 5. 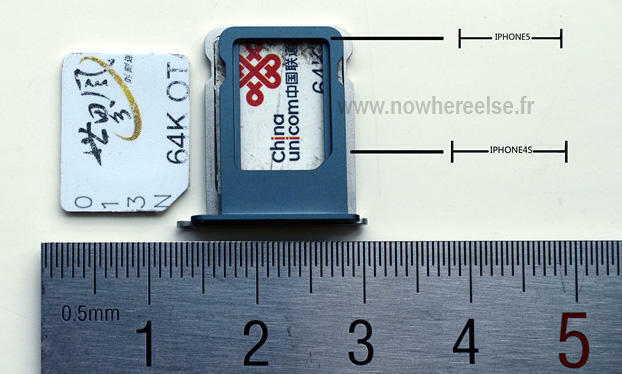 Nowhereelse.fr [Google translation] obtained what it claims to be the nano-SIM tray for the upcoming iPhone 5. Apple has been fighting hard to get this SIM card standard accepted by various governing bodies as it wants to be able to conserve as much space as possible inside of any future devices. Seeing the supposed iPhone 5 part compared with the iPhone 4S SIM tray, it isn’t that much smaller, but every millimeter counts when it comes to electronics. This isn’t the first time a supposed iPhone 5 nano-SIM tray has popped up. The last time was in May, and at that time it was cut out of aluminium. They look quite similar, so there is a chance that the one from a few months ago was a test cutting. With the rumored iPhone 5 announcement on September 12 – and possibly the iPad Mini as well – it won’t be long before we found which of these numerous leaks have been correct.